I got the Momofuku Milk Bar cookbook for Christmas (thanks Santa!) and decided to give the Compost Cookies another try. I had made them before, but that recipe differed a bit from the one in the book, and although the first batch was really tasty they were also really flat and crunchy and I hoped that the correct recipe would remedy that. Alas, no. Maybe it's something I'm doing wrong, or maybe they're supposed to be like this (but I don't think so), but they ended up pretty much identical. Or worse, but probably because I unwisely added a bunch of M&M:s and those turned out to be way too sweet for my liking. So, I won't even bother to give you a proper recipe - if you want to make them, check out my first post on the subject instead! It's a GREAT idea to mix in potato chips and pretzels though, I love the sweet-salty balance. I've made these a few times and they're always a big hit. They usually puff up for a bit during baking and then deflate, but you know what? The Compost Cookies sold at Momofuku are pretty flat! 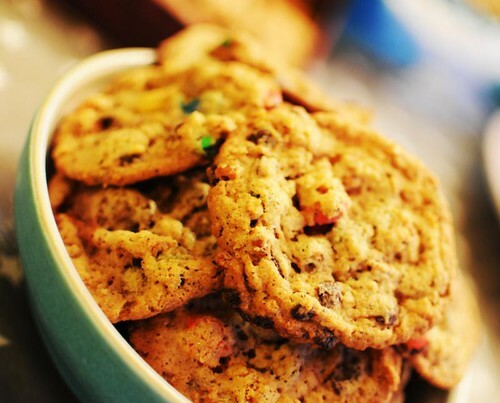 They're like most American chocolate chip cookies, though, so it doesn't much matter as long as you get the salty-sweet-crunchy effect -- the salty part is important -- and don't overbake. Yours look just right, so you could just take yours out of the oven a bit sooner. In my experience gooey mix-ins, like crushed Daim candies, melt too much at the high temperature. It does help to freeze the dough, but that's how I make most of my cookies: freeze rolls of dough, and slice off and bake a few whenever I want cookies. Chanterelle,thank you so much! I've never had the original, but the pictures look a little fluffier - maybe more so of the other cookies though. (I'll try the chocolate cookies next!) Crushed daim sounds like a pretty tasty mix-in though, melted or not! I had some chocolate-covered caramels this time, delicious - but they brought the cookies to an overall too sweet level. I usually scoop out the cookie dough and freeze the scoops - it's great to have in the freezer! These look so good. I've never tried them but now I think I just might have to! Oooh, those are my favourite cookies in the whole world! I can't wait to give the recipe a go. What do you think of the book in general? It's on my amazon wishlist, but I've been too distracted by other amazing cookbooks to actually get around buying it.